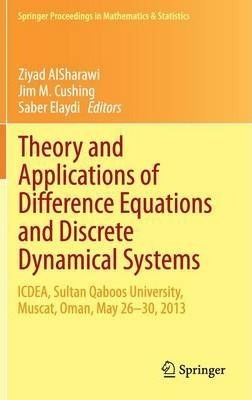 This volume contains the proceedings of the 19th International Conference on Difference Equations and Applications, held at Sultan Qaboos University, Muscat, Oman in May 2013. The conference brought together experts and novices in the theory and applications of difference equations and discrete dynamical systems. The volume features papers in difference equations and discrete time dynamical systems with applications to mathematical sciences and, in particular, mathematical biology, ecology, and epidemiology. It includes four invited papers and eight contributed papers. Topics covered include: competitive exclusion through discrete time models, Benford solutions of linear difference equations, chaos and wild chaos in Lorenz-type systems, advances in periodic difference equations, the periodic decomposition problem, dynamic selection systems and replicator equations, and asymptotic equivalence of difference equations in Banach Space. This book will appeal to researchers, scientists, and educators who work in the fields of difference equations, discrete time dynamical systems and their applications. Illustrations note 23 Illustrations, color; 6 Illustrations, black and white; XVI, 222 p. 29 illus., 23 illus. in color. Papers by Invited Speakers: Competitive exclusion through discrete time models: Azmy S. Ackleh and Paul L. Salceanu.- Benford solutions of linear difference equations: Arno Berger and Gideon Eshun.- Harvesting and dynamics in some one-dimensional population models: Eduardo Liz and Frank M. Hilker.- Chaos and wild chaos in Lorenz-type systems: Hinke M. Osinga, Bernd Krauskopf and Stefanie Hittmeyer.- Contributed Papers: Almost automorphic sequences and their application to a model of cellular neural network: Syed Abbas.- Advances in periodic difference equations with open problems: Ziyad AlSharawi, Jose S. Canovas and Antonio Linero.- An Evolutionary Beverton-Holt Model: J. M. Cushing.- The periodic decomposition problem: Balint Farkas and Szilard Gy. Revesz.- Existence of periodic and almost periodic solutions of discrete Ricker delay models: Yoshihiro Hamaya.- Generalized Lagrange identity for discrete symplectic systems and applications in Weyl-Titchmarsh Theory: Roman Simon Hilscher and Petr Zemanek.- Dynamic selection systems and replicator equations: Zdenek Pospsil.- Asymptotic equivalence of difference equations in Banach Space: Andrejs Reinfelds.